The team isn't giving a precise timeline at this point, but Honeywell seems to be more of less on the typical timeline following Tommy John surgery in February. The 23-year-old is yet to make his big-league debut but seemed to be on the verge of doing that when he suffered his elbow injury. 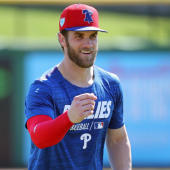 If he looks good in the minors, it may not be long before he's up in the big leagues, though his workload will be monitored very closely throughout his first year back.